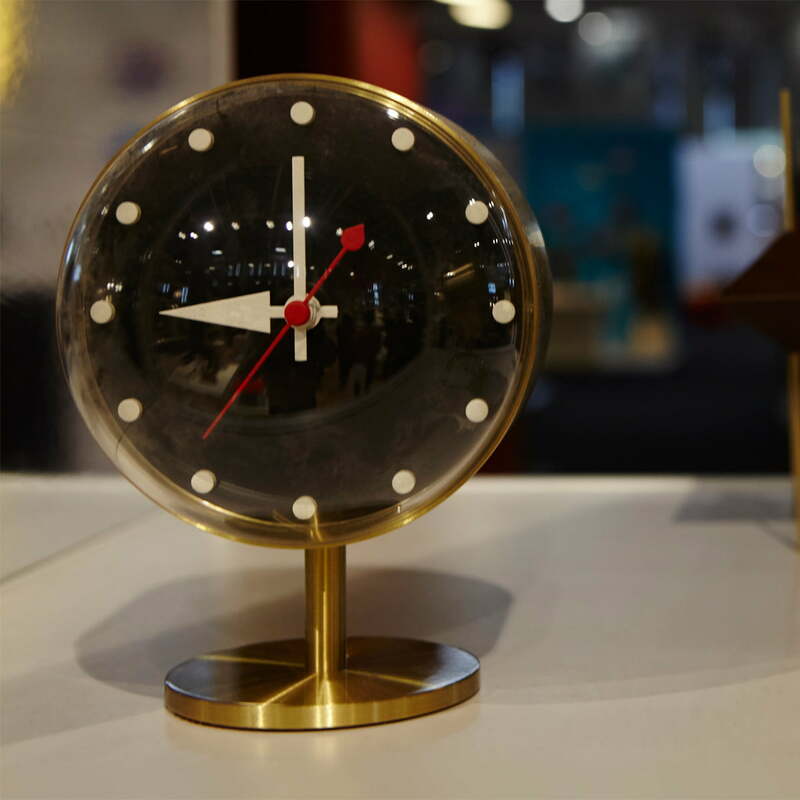 An original classic: George Nelson has designed his round Night Clock in the year 1948. The desired collectors’ clock hasn’t lost any of its charm, even a few decades after its first appearance. With its original colours and forms the table clock is also today a refreshing alternative to the common time chronometers. 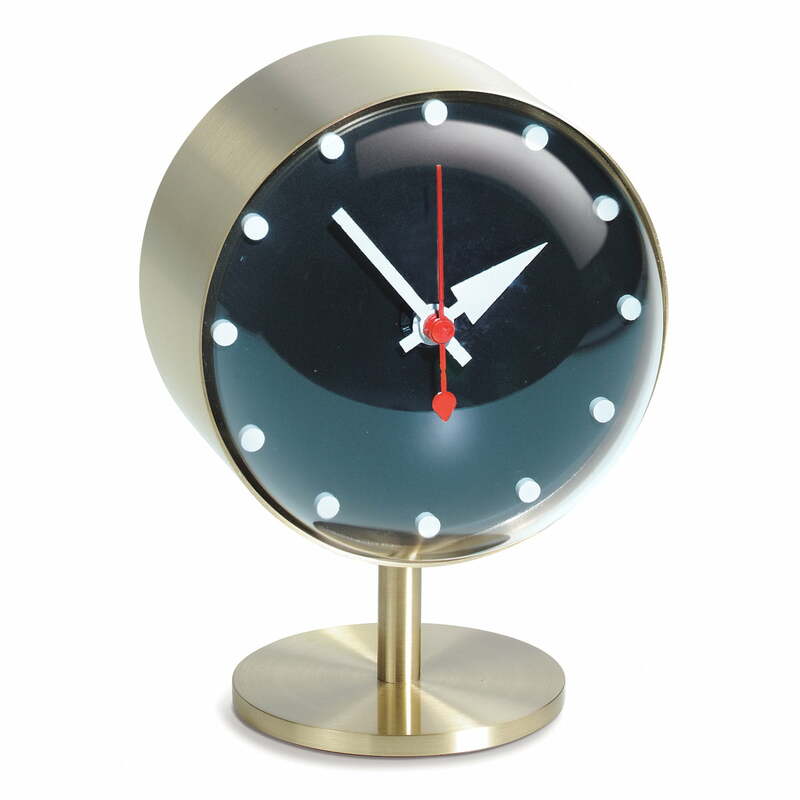 The Night Clock has been designed by George Nelson as part of the Desk Clocks collection. The single table clocks of the mini series all emerged between 1947 and 1953. With its sculptural forms and the chosen colours and materials, the clocks embody the life-feeling of the 1950s. The company Vitra manufactures the George Nelson Night Clock today in an original re-edition out of brass and acrylic glass. The table clock’s clockwork consists of high quality quartz and is delivered with a 1.5 Volt battery, ready to work. The Night Clock by Vitra, designed in 1948 by George Nelson. The desired collectors’ clock made of brass hasn’t lost any of its charm, even a few decades after its first appearance. Single image of the Night Clock table clock by Vitra. The design is by George Nelson from 1948. The table clock’s clockwork consists of high quality quartz and is delivered with a 1.5 Volt battery, ready to work.